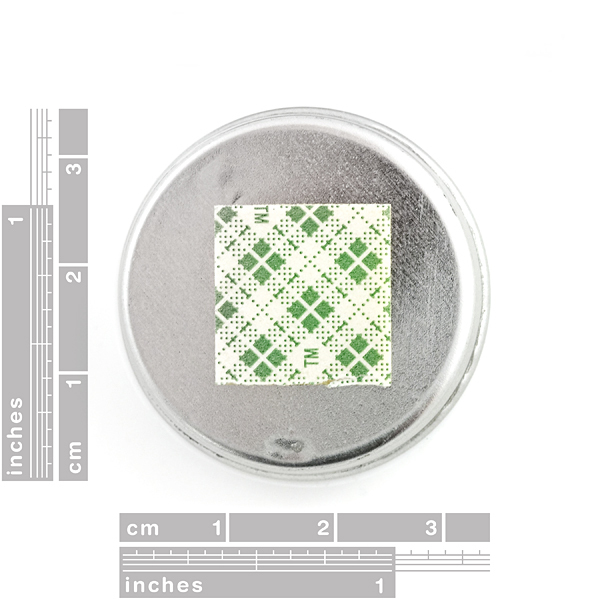 Just wipe the oxidized soldering tip at normal soldering temperature into the tip tinner for a few seconds until the bright tinning surrounds the working end of the tip, then wipe the excess residue on a wet cellulose sponge - it's that easy! 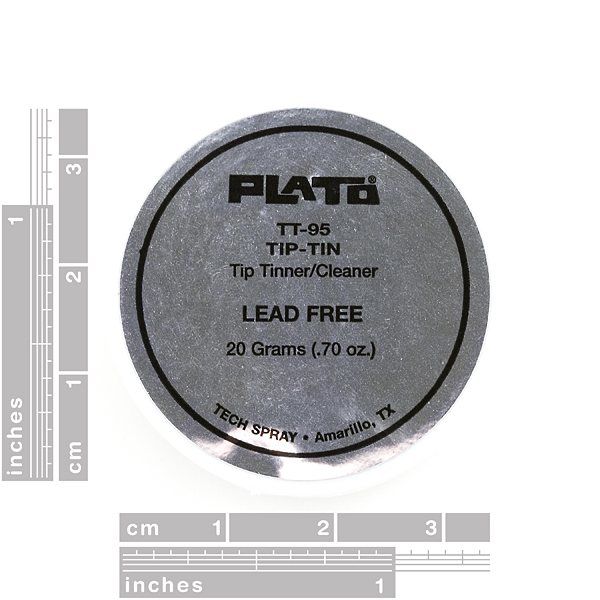 Plato Tip-Tin TT-95 is sealed in packs of 10. Samples available. 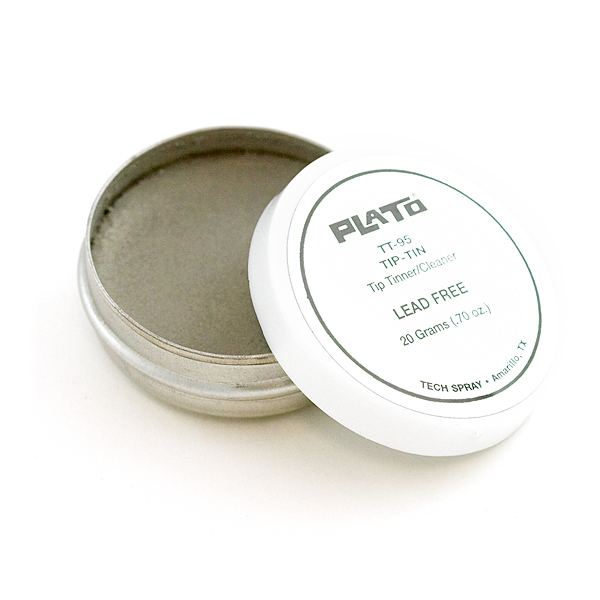 Does the solder from the lead free tinner play nice with leaded solder? 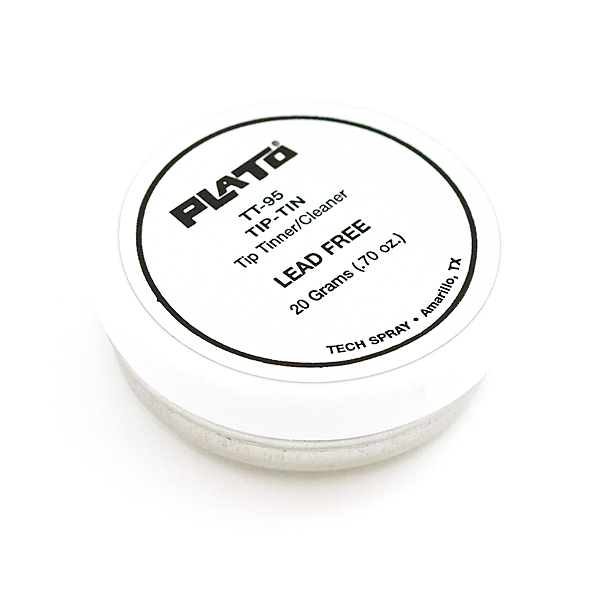 I notice you include this tinner and leaded solder in your tool kits, which is why I ask. Is there a recommended way to use this stuff? This stuff is amazing. It was able to re-tin a soldering iron tip that was exposed to about two weeks of continuous heating (oops!) with no problems. I have some multimeter test leads that are starting to oxidize; will this hinder the function of the multimeter test leads? I really frequently like to buy from sparkfun, but this stuff is pretty expensive. It's not that sparkfun is charging too much for it- it seems retail is similar- but does anyone know if there's a cheaper way of refreshing my tips? Eventually I'll upgrade to this, but I just bought a new iron and can't quite afford the tinner. Tips will always oxidize a bit over time; you can keep them fresh by frequent wiping on the sponge while you're using it, cleaning with a bit of flux if you have it (that's what's in the tin above), and as a last resort, with a minimum amount of gentle sanding with fine-grit paper or a file. I personally like to melt some solder onto the tip and leave it there before turning off the iron when I'm done using it. This "seals" the tip from exposure to the air until you use it the next time. Just wipe off the old solder after it gets hot, and you should see a fresh, shiny tip. I used this stuff for cleaning a bad solder type's flux off my iron tip. My iron's tip was caked with basically a glass for about an hour and a half. Should this be kept in a fridge when not being used? We store ours at room temperature and have never run into any issues with it. If you were low on capacitors and felt the need to desolder an old motherboard, you'd end up with a lot of 'gunk' on your tip from the oldness of the motherboard's solder. If some of it got onto a dry spot on your tip it'd keep it from taking up solder after it burns in - the tinner will help to remove the 'gunk' which ends up turning your tip black and useless after some not-so-great soldering jobs. It's also good to tin it after you're done soldering - as any tip will oxidize and age quickly if not coated. This is a very good product, now my tips are perfectly clean. Thanks a lot.